The name Wausau is recognized for high-performance, high-quality products; depth and breadth of experience; and industry leadership. Wausau understands the sensitivities of preserving tax credit-eligible historic buildings and historically influenced renovations. Custom Window™ by Wausau’s historically accurate products are designed to match the distinctive details of steel replica windows, true divided lite muntin grids and era-appropriate color combinations. 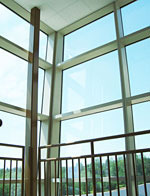 Click here to view Custom Window by Wausau’s family of historic window products.